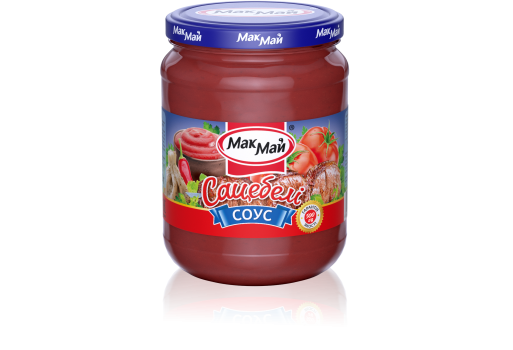 Sauce “Satsebeli” from TM “Makmay” is made of sweet ripe tomatoes, fragrant Caucasian spices and hot flavorings , which give a rich flavor and emphasize the hot nature of this sauce beloved by many. Sauce “Satsebeli” is a characteristic complement to your main course. Its spicy and unusual taste allows to take another look at the familiar meat or fish dishes, sauce “Satsebeli” from TM “Makmay” is also indispensable for pelmeni and stuffed cabbage, they acquire unusual and fascinating taste. A perfect flavor combination - the sauce “Satsebeli” and Tobacco chicken. Energy value of 100 g of product: 325,2 kJ (77,7 kcal). Nutritional value of 100 g of product: proteins – 0,7 g; carbohydrates – 18,0 g; fat - 0.4 g.